Heat a small saucepan with 1 tsp vegetable oil over medium heat. Add the shallot, garlic, and ginger. Sauté until fragrant, about 2 minutes. Add the banana and cook for 1 minute longer. Add the turmeric and curry powder and cook for 30 seconds to release aroma. Pour in vinegar and water and scrape up any bits stuck to the bottom of the pan. Bring to a boil and then simmer for 10 minutes. Season with lemon juice and salt. Pour contents into a blender and puree until smooth. Return mixture to pan and keep warm. Season scallops with salt and pepper. Cook one minute on each side, until scallops are golden and cooked through. 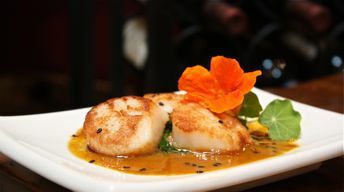 Serve curry over scallops. Basmati rice or lentils make an excellent side dish.